Mostly, though, it's just fun. It's December 1999. I'm sitting in my best friend's smoke-filled bedroom, frantically mashing the buttons of an N64 controller and having the time of my life. Six months later, I'm in the same smokey hovel, but now I'm deftly dodging attacks, timing blocks and dancing between the platforms of Planet Zebes. And I'm still having the time of my life. This has been the core appeal of the Super Smash Bros. (SSB) series since day one: No matter your skill level or play style, get together with a bunch of friends, and you're going to have a lot of fun. Put in the time to master the game, though, and you'll find a rewarding and deep fighter. Fast-forward the best part of two decades, and at E3 2018, Nintendo has taken the wraps off its latest SSB game, Super Smash Bros. Ultimate. A large portion of Nintendo's Direct presentation, and indeed its cavernous E3 booth, was dedicated to the brawler, which is due for release on the Switch December 7th. The new entry promises more of everything than ever before. Every single character that's been playable in an SSB game in the past -- that's over 60 -- will be included, along with some new faces. 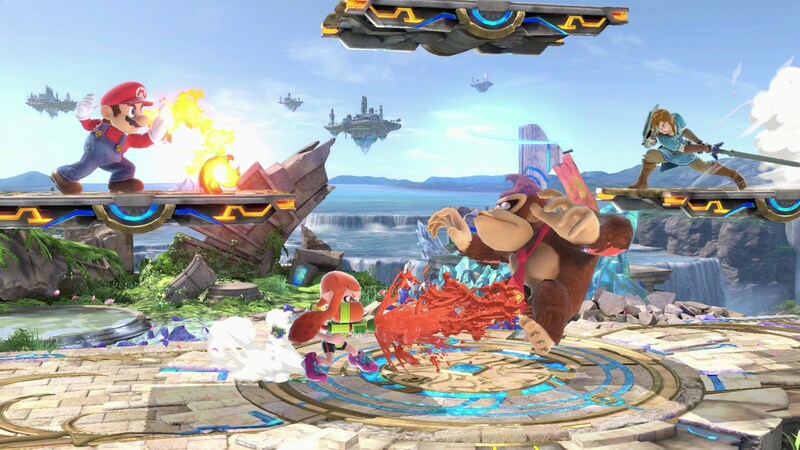 So far Ridley (Metroid's alien dragon antagonist) and the Inklings from Splatoon are the only additions confirmed, but given Nintendo's form, you can bet a bunch of new characters are going to make their way to the final game. Mechanically, the main changes seem to be some slightly tweaked physics, and much more of an emphasis on high risk, high reward timing. Masahiro Sakurai, director of every SSB game to date, said the new engine was made to play faster, and that's apparent from the start. An hour after the Direct presentation wrapped, my colleague Mat Smith and I made our way to a media pen behind Nintendo's booth and grabbed a pair of Pro Controllers. I picked Agent 3 (one of the Inklings), while Mat grabbed Ridley. He utterly smashed me. The next game, Eurogamer's Tom Philips joined us, and proceeded to beat me into the ground. I think it took four games for me to record my first victory (with Fire Emblem Fates' Corrin). It takes me a stupid amount of time to get used to a new SSB game, so there was no chance of me pulling off the new dodges and timed blocks, or even really getting to grips with the physics. But the 30 minutes or so I played told me everything I needed to know right now: This game is a lot of fun. It's going to be fun to play, fun to learn and fun to master. We'll learn a lot more about Super Smash Bros. Ultimate over the coming months, and I'm excited to see actual competitive players duking it out at the invitational tournament Nintendo's arranged at E3. In the meantime, rest assured you're going to enjoy yourself this December.